What a lucky break at Freeway Park! 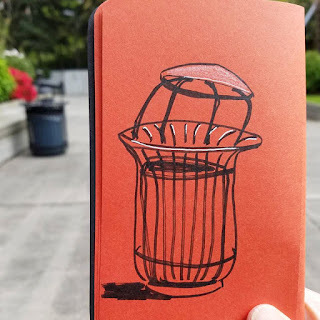 It could have just as easily rained (and did earlier in the day), but when a small group of Urban Sketchers Seattle gathered mid-morning, it was already warm enough in the sun to enjoy the whole time outdoors. Built in 1976, Freeway Park was considered innovative enough to include in the 2016 PBS documentary, “10 Parks that Changed America” (which includes Seattle’s Gas Works Park, too). The five-acre public area isn’t wide open as most parks are. 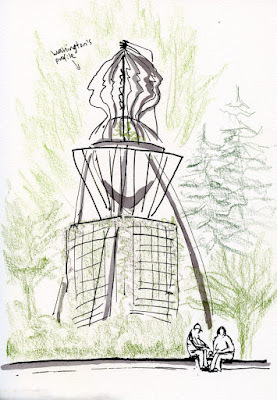 Instead, it has many concrete stair-stepped nooks filled with trees and other plants, art works and even a waterfall (though it was turned off today) that make you (almost) forget that I-5 is just a short distance below. 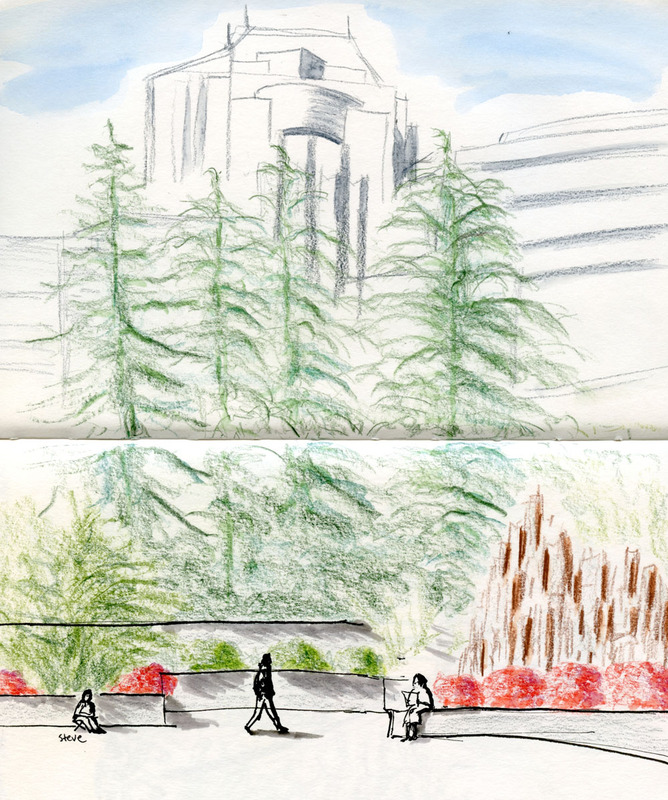 Occasionally skirting clouds, the sun warmed my back most of the time as I sketched the park’s most open part near the entrance to Convention Center. In the background is the top of the US Bank Centre Building (where we sketched inside a couple of months ago). A little later I walked around a corner and found “Seattle George Monument,” a sculpture by Buster Simpson. While sketching it, I perceived only Washington’s distinctive profile (facing left). 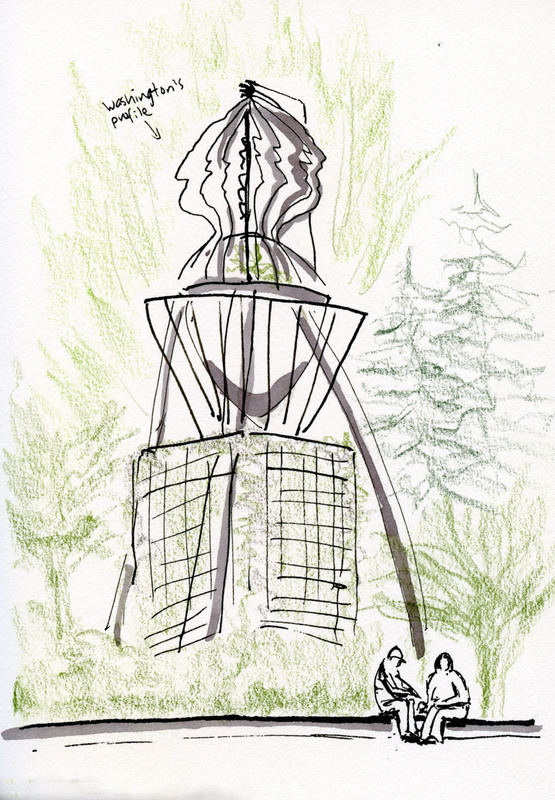 But when I read the artist’s statement about the piece later, I learned that it “simultaneously portrays Chief Seattle (originally Chief Sealth) and George Washington.” The nose cone of a Boeing 707 forms the bottom of the planter beneath the profiles. I had only seven minutes until the sketchbook throwdown, but I was loathe to squander even a second of outdoor-sketching time, so I used those minutes to sketch a trash can with its top askew. I’m almost afraid to say it aloud, lest I jinx it: Is outdoor sketching season finally here?